Mierda del Cielo was created in just one night using a photo camera. It is a stop-motion short. It was given as a DVD to the buyers of the magazine "Ombligo 23", a publication about Art & Hermeticism that existed between 2006 and 2009. 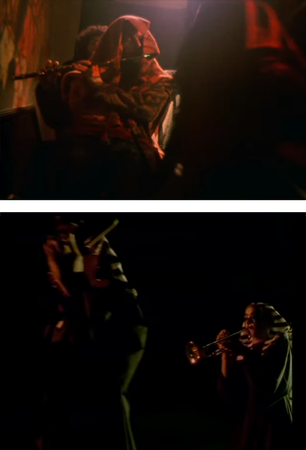 "Earth: Inferno" was filmed and edited between 2003 and 2004. This short film was a homage to the book "Earth: Inferno" by the painter and sorcerer Austin Osman Spare. By the time we filmed it, there was nothing filmed about AOS, so this one became the first film about one of his works. After writing a script for the movie, Mor and I decided to participate with it in a script contest that would finance some of the production costs. 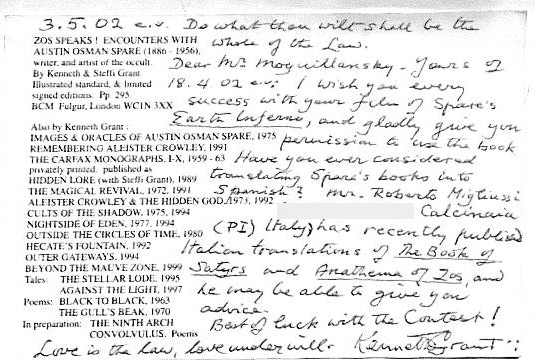 So we wrote a letter to Kenneth Grant, the friend of Austin Spare who had inherited the copyright of his works... and the person without whom the works by Austin Osman Spare may have been unknown for probably everyone. We told him in a letter that we wanted to film this movie and asked him if he could give us the copyright permission. I will never forget the day in which the postman brought me a letter from Kenneth Grant. I was trembling and I almost fainted. He was wishing us good luck with the contest (we finally won!) and giving us his permission without asking anything in return. We always remember how kind he was with us. Two other persons helped us a lot too: Gavin Semple and Robert Ansell, owners of Fulgur Limited, who published the movie as a DVD in 2004. Gavin Semple also composed and performed the music for the movie, besides from becoming the male narrator. His book "Zos-Kia : An Introductory Essay on the Art and Sorcery of Austin Osman Spare" was the best essay I had read about the art of AOS; so it was a pleasure to work with him in the movie, his book was for sure one of the big influences that Mor and I had whilst writing the script! We had a lot of reasons to film "Earth: Inferno", one of them was that there was no way to film a literal version of the book; so we were forced to create our own version as the only possible way to stay loyal to its spirit. Last, but not least, we always remain grateful to the Argentinean filmmaker Pablo César, who gave us his support and helped us a lot with this project.